Were excited to announce that our USD 12 million dollar renovation is now completed. The extensive renovation will provide guests with superior accommodations and a highly satisfying stay. We invite you to experience it for yourself and enjoy our beautiful new lobby and atrium featuring a breathtaking water feature. Get a wonderful nights rest in our remodeled suites and enjoy amazing on-site amenities such as our updated pool fitness center and a unique dining experience at Eterie. We look forward to seeing you soon. This hotel is 100pct non-smoking. 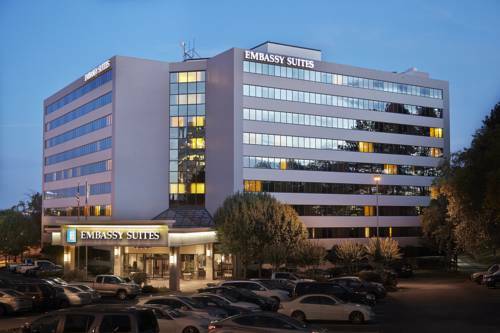 Welcome to the Embassy Suites Atlanta - Galleria hotel. Our hotel is conveniently located across the street from the Cobb Energy Performing Arts Centre Cobb Galleria Event Centre the Galleria Office Park and the Cumberland Shopping Mall in Northwest Atlanta. Also nearby are Dobbins Air Force Base Campus of Georgia Tech University Campus of Georgia State University Phipps Plaza Shopping Mall Lenox Square Shopping Mall CNN Center Georgia World Congress Center Atlanta Market Center Guests of the Embassy Suites Atlanta Galleria hotel will enjoy our famous fully cooked-to-order breakfast /see our interactive site www.myomelet.com/ as well as our nightly Manager*s Reception. Here are more activities for your consideration to enjoy when you stay with us Six Flags over Georgia White Water Atlanta Theme Park High Museum of Art Georgia Aquarium Georgia Dome Turner Field Home of the Atlanta Braves Phillips Arena Home of the Atlanta Hawks Zoo Atlanta Underground Atlanta World of Coca-Cola Museum Martin Luther King Historic Site Fernbank Museum Carter Presidential Center Please click the accommodations link above to see all the amenities available to you while you stay at the Embassy Suites Atlanta - Galleria hotel.